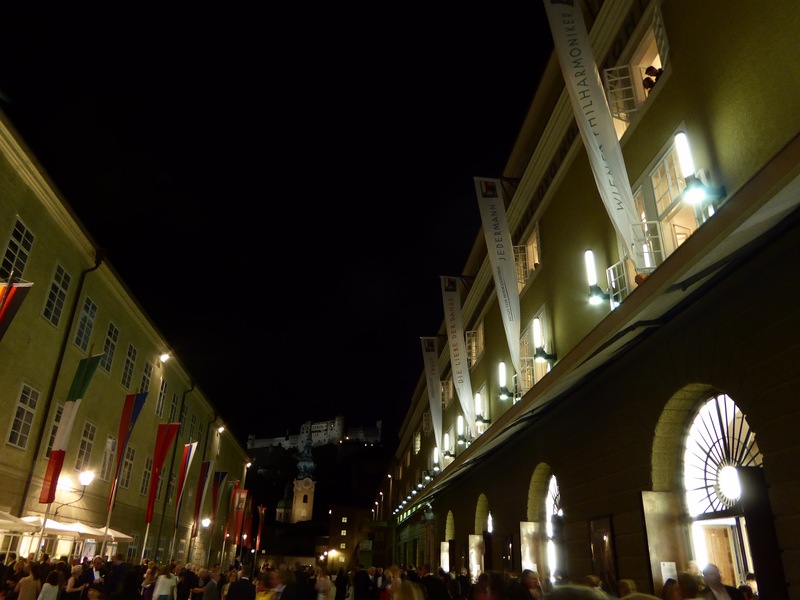 This was an interesting night at the opera – actively following the leading artists on social media, as well as preparing for the performance with a help of Salzburger Festspiele rich media library, I already had some perception built for what to expect on the last night of my annual trip attending the performance of “Faust”. During the day strange coincidence happened – @OperAdvisor posted tweet reminding of opportunity to attend the performance and mistakenly attributed authorship to Berlioz – probably confusing with LaDamnation. Seems like an omen – as what I heard in the festival hall was no romantic, lively and thrilling masterpiece of Gunoud, but dramatic, quite dark interpretation of the score somehow reminding Berlioz or Verdi. The usually exquisite sound of Vienna Philarmonic turned into a sum of instruments, and quite frequently covered singers, even seasoned performer Piotr Beczala had issues to project his voice over orchestra into the audience. As my seat was almost at the same place where I was seated for Danae, none of it can be attributed to the seating, thus most probably young Argentinian conductor Alejo Pérez has to take the credit. His conducting emphasised dramatic scenes, and even in most romantic moments like Jewel Song (Ah! je ris de me voir si belle en ce miroir) by Marguerite, exquisitely sung by Maria Agresta, lyricism sunk in the orchestra pit. The unnecessary change of tempi and peculiar accents in reading the score did not convince me of proposedly new interpretation qualities. 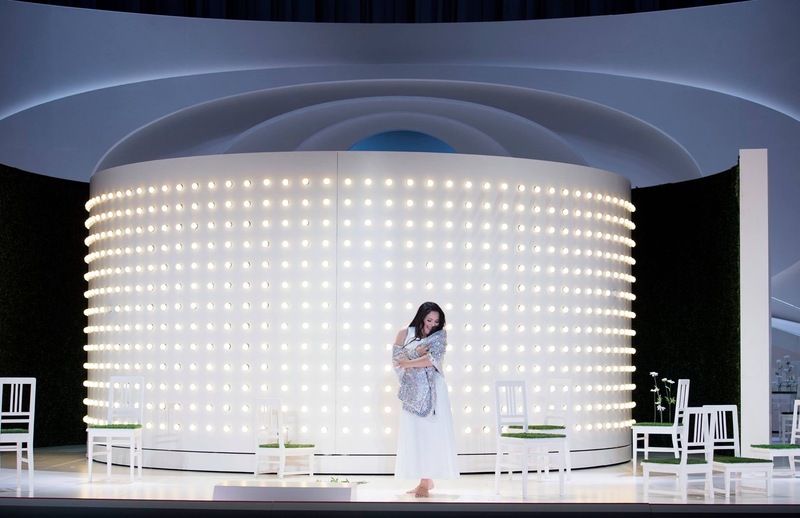 Maria Agresta as Marguerite demonstrates the versatility of her instrument colouring the role from naive, innocent girl led by romantic dreams gradually transforming into dramatically intense final scene. Her top notes are clearly produced and her pianissimi filled with intensity. My previous exposure to her artistry was mostly verdian – I Due Foscari at ROH, and initially I was wondering if the role of Marguerite will be a good fit for her voice. Without any doubt her performance was outstanding, and she made a great member of the vocal superpower of the cast. One of the top expectations of the night was related with Faust to be interpreted by Piotr Beczala. The previous encounter with Piotr was recently in Paris where he sang together with Elīna Garanča in Werther thus French opera seems to fit him naturally. Even if the role is in Beczala’s repertoire for quite a long time, he does not sing it very frequently ; thus I have not had an opportunity to encounter his performance before. Undoubtedly, Beczala is one of the top tenors nowadays, and it is always a pleasure to attended a performance with him in a lead role. His voice has that unique bright and soft tone and seems that no high note or complexity of the score might be a challenge. Beczala demonstrated his mellow and clear timbre with a right mix of tenderness and determination thus creating a multifaceted character. As one of the director’s comments regards his interpretation of the libretto indicates that transformation of the main protagonist happens in his own delusional mind, and in fact is just a dream, many of transformations and appearance changes became easier understandable. Beczala is an excellent singing actor, who has said many times that his preference is to paint the character with vocal means rather than by stage actions. Nevertheless, his interactions with stage partners are justified and intended to add meaning. Last night it seemed that director had put too much load on singers’ individual acting capacity and stage instincts thus creating some awkward moments which probably will disappear in next performances. Current opera season has unintentionally shifted towards French opera and included at least three different “Faust” productions seen. Even if opera is named after the main protagonist – Faust, actually Méphistophélès is the one of the particular interest. Ildar Abdrazakov as Méphistophélès created a playful and evil character, his “Le veau d’or” supported by shimmer-clad dancer pretending to be a golden calf, was delivered with emotional charge and vocal perfection. Abdrzakov lives in the role of deceptor and vile agent. He has regal posture and matching vibrant voice with very pleasant timbre. In overall Abdrazakov demonstrated stable well-rehearsed performance with engaging acting. Together with Piotr Beczala, they created a convincing duo of mental and moral challenges faced by each of us when it might be difficult to choose which one is right if they both look the same and are both so attractive. One of the most pleasant surprises of the night was juicy, velvety baritone of Alexey Markov as Valentin. He delivered very stable and well balanced vocal performance, and probably was the only one who did not suffer from orchestral dominance over singers, and he also demonstrated convincing acting through lyrical and confrontational scenes. His most touching interpretation of “O sainte médaille … Avant de quitter ces lieux by ” mesmerised audience which burst into ovations. Tara Erraught in the role of Siebel did a great job vocally, the only issue being her visual representation in accordance with the intent of Reinhard von der Thannen. It is a challenge for quite some mezzos to fit into typical “trouser roles” and look boyishly, and this can be solved by appropriate costume and makeup means, – which dod not work quite well this time. The program brochure contains costume sketches, and variation of actual one might have been much better than actual choice. This is to emphasise that Tara delivered sensitive, emotionally charged portrayal of Siebel regardless of some minor challenges in cooperation with conductor and orchestra dominance. 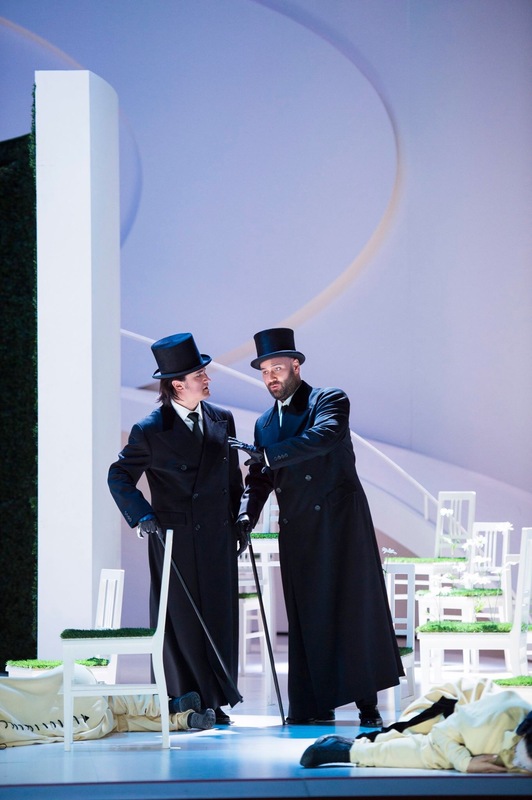 Paolo Rumetz as Wagner was dramatically engaging, as well as Marie-Ange Todorovitch as Marthe created another angle in dynamics between main protagonists. Staging and director intent of Reinhard von der Thannen becomes better understandable only after concept remarks are read in the program book – the optical lens as stage concept is difficult to read without an extra hint. Some elements in the set design are not clear; as an example: question arises why descending skeleton was needed, it had more sarcastic rather than conceptual use. Church organ pipes like spears descending from the heaven is an interesting element used smartly in the context of the scene. Dancers were a proper addition to the chorus, as their moves were supporting stage action and complementing the story. 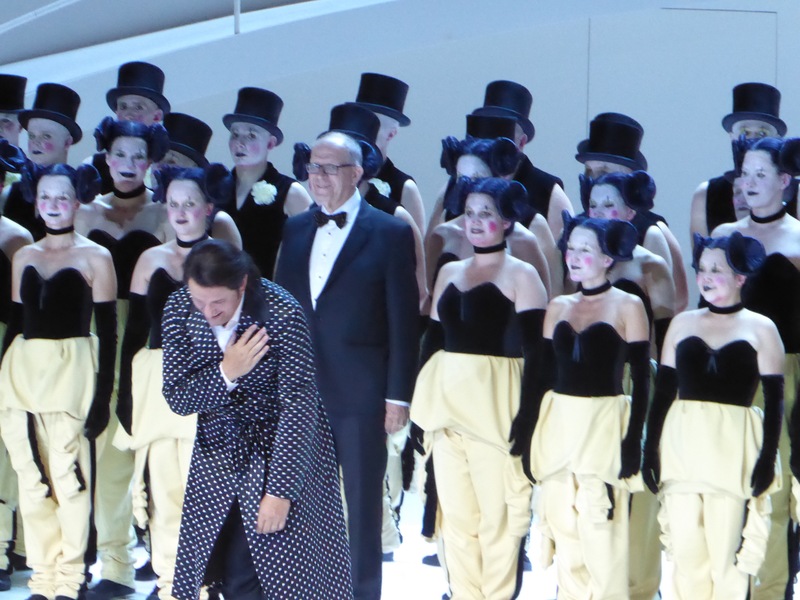 The costumes and overall appearance of chorus reminded some of Neuenfels creations, which was confirmed by short fact check confirming that Neuenfels and Reinhard von der Thannen have a long history of cooperation, including legendary Bayreuth productions, Lohengrin in particular. At the midpoint stands the ease with which people can be seduced and manipulated. The chorus as a reflection of society exposes the false piety and the double standards of a bourgeois, conservative world view with all its repressions.